An established lake-side neighbourhood in Southern Etobicoke, West Toronto, Mimico is now one of the fastest-growing and most desirable areas of the City. A small-town community feel is combined with burgeoning businesses and outdoor recreation opportunities along the lake. There are many varieties and sizes of housing, including large renovated single-family homes, smaller bungalows and modern condominiums, all within a short commute to downtown Toronto via GO train or on the Gardiner Expressway. In addition to the outdoor pool and picnic area, the Mimico lakeshore has recently been revitalized to include a huge new boat-themed playground, a splash pad (slated for completion in time for summer 2018) and Mimico Linear Park, an extension of the Waterfront Trail, giving Mimico residents a direct line to downtown along the waterfront. In Humber Bay Shores to the East, there are two huge peninsula parks reaching out into the lake (Humber Bay Park East and West) that include many recreation trails, rock beaches, picnic areas and an off-leash dog park. There is an active community of bird watchers, dog walkers and nature lovers who enjoy and care for these parks regularly. For those who enjoy boating, there are two yacht clubs in Humber Bay Park West – Mimico Cruising Club and the Etobicoke Yacht Club – as well as a public boat launch and the Humber College Sailing School. The John English Community School, Mimico Tennis Club and the Mimico Arena also contribute to the range of local sports and recreation facilities. Many Mimico residents enjoy lacrosse and hockey – Mimico-raised Dave Bolland and David Clarkson now play in the NHL, and the two Mimico lacrosse teams have won several National Championships. The Humber Bay Shores Farmers Market runs out of Humber Bay Park West from May through October. The Humber Bay Shores Condominium Association also runs several other public events including the annual Waterfront Festival, Golf Tournament, and Annual Clean Up. To the West, community organizations like the Mimico Residents Association, the Mimico-by-the-Lake BIA, Lakeshore Arts and Mimico Children’s Choir host several annual community events including the Party in the Park, the Family Halloween Dance, Culture Days, the Christmas Tree Lighting and the Christmas in Mimico Community Concert. As development continues in the area, exciting new businesses are moving in such as Orange Theory Fitness at Westlake at Parklawn, Lola’s Gelato in Humber Bay Shores, and fine dining at restaurants such as Eden Trattoria, Tich Indian Cuisine and LaVinia. Successful franchises of larger chains such as Metro Grocer, Starbucks and Tim Hortons are also popping up in the Parklawn/Lake Shore West area with population growth in neighbouring condominiums. There are several schools in the area, including St. Leo’s Catholic Elementary School, George R. Gauld Junior School, David Hornell Public School and John English Junior Middle School, which has a French Immersion program starting in Senior Kindergarten. The Mimico Adult Learning Centre houses TDSB Continuing Education courses, as well as the Rec Room after school and day care centre. 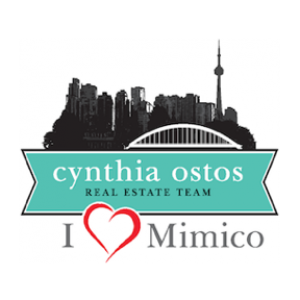 Mimico was originally founded as a sawmill settlement in the 1850s, with the majority of founding families being farmers. 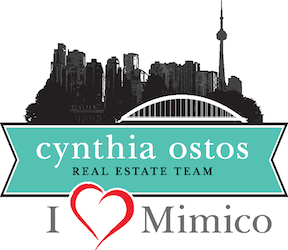 In 1917 Mimico became an independent town, and later merged with the Town of New Toronto and the Village of Long Branch to form the Borough of Etobicoke. Etobicoke was amalgamated into the City of Toronto in 1998.